How did your basement hold up after the recent rainstorms? If you’re like many Kansas City residents then the answer is “not so good.” The recent swath of storms that passed through Kansas City left a lot of mess in their wake. A lot of that mess centered around flooded basements. Depending on the circumstances this type of flooding could be a real disaster. If your basement was just used for storage than water damage might have ruined a couple of boxes. On the other hand, if your basement was used for a family room or guest bedroom then water seeping in from the outside could have destroyed carpet and furniture. One thing is for sure: where there is damp there is the potential for mold and that’s not something you want taking over your home. There’s nothing you can do about that but get rid of it all. You can get rid of your basement junk by hiring a crew of local based professional junk haulers like Junk King Kansas City. These are teams of licensed and insured workers who have a lot of experience in all kinds of junk removal. This even means junk that is sopping wet. They won’t be bothered by the mess one bit. 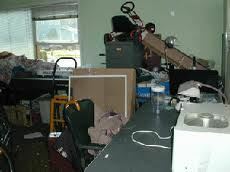 What they can do is help you get all that wet junk out of your home before any mold can start to grow. Once that has been accomplished you can bring in another crew of professionals to water proof the basement. This is all part of being a homeowner! If you were spared any storm damage, count yourself lucky. However, you might not be spared from a basement full of junk that should be tossed out. It’s easy to store things in the basement. It’s just a trip down the stairs with a big box of junk then into a corner and it’s forgotten about. Once you’ve crossed that line there is no turning back as more and more junk starts to pile up. Pretty soon the junk in your basement has taken over. What was once a decent space in your home is now a storage locker. That’s no way to enjoy your basement. Wouldn’t it be nicer to have a family room downstairs? Or maybe a home theatre? Or a home office? When it comes to what you could do in your basement the list is endless. Here again, Junk King Kansas City can come to the rescue. Now, it might seem as though you’re asking a lot of these crews to make so many trips up and down your basement steps but that is exactly what they are trained for. You won’t hear any complaints. That’s where the professional attitude comes into play. The sooner you can get your basement clear of junk the quicker you’ll be able to turn that space into something productive even if that means you own quiet room! This entry was posted in junk king kansas city, Kansas City Furniture Pickup, Kansas City Junk Recycling, kansas city junk removal, KC Junk Removal and tagged Get Rid of Junk KC, Junk King KC, Kansas City Basement Clutter, kansas city hauling, KC Hauling Services on March 31, 2012 by Mike Stroud. Last updated August 2, 2017 .